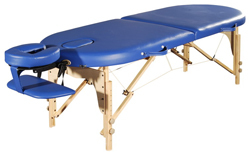 The Healers Choice Massage table is a solid timber framed table. This great value package includes a face recess plug, adjustable face crest, arm rest and carry bag. The accessories provide extra comfort for your clients, extra length to the table and better access to the neck area for the therapist. Reiki, and other therapists using energy, will appreciate the beautifully crafted timber frame which allows a free flow of energy. The added advantage of Reiki end panels means better access at each end of the table, making this table the Healers Choice! This table is ideal for students or those on a budget who are looking for a sturdy, reliable, commercially rated table.